Read Genesis 4:1-15. What does this tell us about how deeply ingrained sin had become? At its basic level, it simply reveals that Eve thought she had delivered the One whom the Lord had promised (Gen. 3:15) . Nothing is said of the joy of Cain’s boyhood years and the novelty of new parents proudly enjoying the development of their first baby. The narrative jumps quickly to a second birth and then to the two young men worshiping. However, as we so often see, differences over worship lead to tragedy. Read Genesis 3:9-10; Genesis 4:9. Compare Adam’s reaction with Cain’s reaction when God questioned them after each one sinned. What is similar? What is different? Note the differences in the emotions of Adam as compared with Cain. Adam appears confused, frightened, and ashamed (Gen. 3:10) , but Cain is angry (Gen. 4:5) , cynical, and rebellious (Gen. 4:9) . Instead of offering a weak excuse as Adam did, Cain tells a blatant untruth. However, out of the despair came a measure of hope and optimism. With the birth of Seth, Eve again thinks she has delivered the Promised One (Gen. 4:25) . The name “Seth” is from the word that means “to place or to put, ” the same word used in Genesis 3:15 for a Deliverer who would be put in place to challenge the serpent and crush its head. In a further parallel to Genesis 3:15, Eve describes her new son as “the seed” to replace Abel. Thus, even amid so much despair and tragedy, and as the great controversy between good and evil continued to spread, people still clung to the hope of redemption. Without it, what do we have? Imagine the woe of Adam and Eve over the death of their son, which would have been bad enough if not for the fact that another son had killed him. Thus, they lost two sons. How can we learn the hard lesson that sin has consequences far beyond the immediate sin itself? Playing the culture card Cain brought of his culture, that of which he was accustomed to present to the Creator, probably thinking God is only concerned about the heart (Genesis 4:2-5). Of course his heart was not right either (Genesis 4:6-8). All sins call for the death penalty (Romans 6:23). However by taking the life of his brother, Cain made it especially difficult for others to sympathize with him, and made himself a target for the same end as his innocent victim (Genesis 4:12-14; 9:6). Remarkably Jehovah acted to protect Cain, the murderer, who was in the camp of the wicked one (Genesis 4:15; 1 John 3:12). Christians who hold that God always shelters the righteous, especially if they pray, and hurt the wicked, especially if the righteous pray, may take note. At times the Lord actively shields the unrighteous, while He may allow the faithful to go down or be martyrs (Mark 6:24-28). Ultimately Jehovah works out His own purpose for the good of the universe (Romans 8:28). Believers are not to wish for the death of their enemies, particularly if God does not will and act (Matthew 5:44-45). At the same time they are to be prepared to work with their Maker, who may not have prosperity and longevity in His plans for their current existence. Jesus made it clear this life is not the reward (John 12:25). Those who need their inheritance now create a scenario for disappointment and expose their faith to be shaken beyond recovery. The last generation of the faithful will trust the Savior implicitly even when faced with death (Revelation 12:11). Their prayers focus more on eternal realities than on temporal concerns (Hebrews 11:35-40). The lesson said that Seth was born after Able died. Did Eve have children between Able's birth and Seth? I understand Able was an adult when he was killed and that Eve was in good health and probably very fertile. Anita: I want to belive that Adam and Eve had other children, daughters and some may have been born between Cain and Seth. You will note that daughters are rarely/hardly mentioned here unless they aided in the Ministry/ gospel work. The age gap not withstanding, their long years of life compensated for this. The deliverer was promised to the first parents, how and when and where he'll be born was not communicated. Eve was hopeful that at the birth of Cain sin had lost his grip on them, but Cain was different deeply grained within was jealousy noted when the brother was born. It became prominent when God accepted Abel's sacrifice and displease came to Cain. I'm I my brother's keeper was his response rude I'll call it, instead of remorse he was proud of what he had done. Comparing to Adam who was ashamed Cain questioned God, and gave out a plain lie. It is likely that Adam and Eve also had younger daughters at the time. The bible does not reveal the records of Eve's daughters. In fact it is not shown whether Cain is her first born child. It is possible she had daughters before and after her sons which is why she may have exclaimed Cain was a male and Seth the promised. Also God created Adam and eve as adults. Our first parents were so close to perfection, whose to say they were not created similarly? One has to wonder. Cain killed his brother Abel. Did Cain go to the wrong school? Grow up in a bad neighborhood? Hang out with the wrong crowd? Abused drugs? Play violent video games as a teenager? The answer is obvious. Who can explain sin and it's immediate results? To explain it is to excuse it. Ray: please allow me comment on this; Just like Eve didn't go to the wrong school, didn't hang with the wrong women in the salon (or women groups) etc, its all the work of the devil who was out to make it difficult for the savior to be born. It has been preached that through Abel's offspring will the savior come. When satan fustrated this by antagonising two brothers with the one being killed, the LORD in His goodness provided another one, Seth. what was the mark that the placed on Cain? the comentary simply warns us against going contrary to God's assigned work or method. The bible seems to suggest that it was a visible sign and the second question is why did the Lord feel it necessary to protect him? Collins, I have a suggestion about the "mark" that was set upon Cain. Cain could not hide the fact that he had "a certain awful expectation of judgement" within his heart. (Heb 10:27 Weymouth.) This fear and insecurity showed in his face, in his countenance, in his manner. And I suggest that this was the "mark" that distinguished him for the rest of his life. Two distinct family lines [and two distinct religions] began to develop. 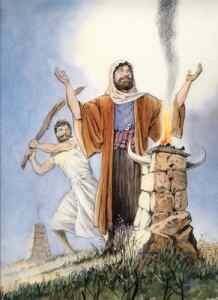 Adam and Seth taught non-retaliation I believe, (and Adam never grew to hate his son!) but because Cain expected retaliation, he prepared himself and his children for it - and he even built "a city" [a "fortified keep"] to defend himself - but the thing is, they ended up becoming the aggressors themselves. The attack from Adam and his faithful children never came. Stewart; this is now confusing. At this early stage of the creation and sin entering the world, the Bible talks of Adam, Eve his wife, and Cain. Abel is already dead and perhaps there are unmentioned daughters of the Adam and Eve. Now where or who are these people who would want to kill Cain? 'He felt that everyone that saw him would want to kill him because of what he had done.' Are these also imaginary people? Imaginary enemies are always around a man that is full of guilt. "While imaginary foes were constantly presented before the minds of the people, the real enemies were strengthening themselves without arousing suspicion or alarm." (EGW Bible Comments vol.2 .p. 1019). The lesson I have learned is that sin always affects more than one person. When I sin, I sin against God, and against others around me that are directly affected by the sin I committed a long with the people that witness my sin. Just as we are not given all the details of Jesus' life or of the life of Cain and Able, the Bible narrative doesn't always give the details of all that went on. We are not told how many years passed,or how many children Adam and Eve had, But the fact that Cain went off and took a wife and had children gives us evidence that many other children were born to Adam and Eve. The Narrative suggests that Seth came after Cain killed Able, so Eve accepted her next son Seth as a replacement for Able. Remember, Adam and Eve lived hundreds of years. they had plentky of time to populate the world. I wondered the same thing however we do not know how old they were when Cain killed Able to the answer could be that yes there were other dwellers. Hello Susan, if the statement from Ellen White is correct -- that Abel died when he was "a youth full of life and vigor" -- then I think we can get a reasonable idea of their ages. It seems that Cain and Abel were 'similar' ages, separated by maybe 4 or 5 years? (I don't know.) But if Abel was in his early/mid 20's when he died, Cain would not have been much older. if they lived to be 900 years back before the flood their youth could be placed at a different age. It is one of the mysteries of the bible and we will not know until we get to heaven. We have no ideal but to guess and why would the gestation period change. I believe that these things, together with a number of other indicators (from the Spirit of Prophecy) help to narrow down the time-frames. The idea that when Adam and Eve left Eden, they looked for the "speedy fulfillment" of the promise of a Deliverer; the idea that Abel died when he was "a youth full of life and vigor", together with other indicators I've seen, all help to give us a clearer idea of approximate time periods. With regards to the human gestation period, of course this can only be a suggestion, but because the physical environment (including the amount of Oxygen in the air, etc.) was significantly better then; and because the "march of physical degeneration" had only just begun, things like the gestation period may have been quite different (i.e. much shorter). I expect also that plants would have grown quicker, and more luxuriantly in Adam's day, even after the curse had settled down upon the earth. We have come a long way from the early glory days of the natural kingdom. a youth full of life and vigor would not be the same back then when they lived to be 900 years of age, like we see them as of today and a youth of today is up in their 20's. And to say they had shorter gestation period is a wild guess and a false statement. If you can back this up with biblical verses then I would like for you to furnish them. All I can say is they were grownups already,the fact that they now were able to return tithe outlines their responsibility towards which they possessed strength to carry out tusks at their own will or strength or knowledge,without any interference from their superiors or elders,furthermore back in the antediluvian age, people lived more prolonged life.They progressed and fulfilled a purpose of which the Lord has commanded in Eden,purpose which was to grow,spread and fill up the earth.I am tempted to think at 16 were already adults and responsible enough.It stretches enough up to the time of Saul who became king at the age of 30 yet he had a son old enough to lead a battle against the Philistines. And David at the age of 15 was already in the king's chambers, a 7 years period that only happens to be time after he battled with Goliath.1 Samuel 16-20. Like Cain, many of us forget that God sees and knows everything(the good and the bad), we sometimes believe that what we do is hidden. Yes it is hidden from man for a time but all things must come to light. In such short amount of time we can see how sin had grown to the extent where Cain was angry at God for asking such a question. Genesis 4:5-10. If we are to compare Cain's attitude then to man's attitude today we would see the damage that sin has wrought on humans and the world at large. We need to always set Christ before us so that He may help us sin less. The question as to whom Cain married or whether there were other inhabitants on the earth before Cain and Abel were born or before Seth was born has been asked since I was a child. I am not aware that this question was addressed anywhere in the Spirit of prophecy (would be happy for further enlightenment on what the Spirit of Prophecy has to say about this). We were not told how long Adam and Eve lived in Eden before the Fall, and we were not told whether Adam and Eve had any children before the Fall. The scenario becomes even more confusing when we were told that in those days, sons of God went in to daughters of men and had children who became giants on earth. Who were these sons of God? and who were these daughters of men? I agree that a clear understanding of these issues would definitely satisfy our curiosity, but I am not sure how much it will advance our faith and preparation for the soon coming of Christ. One thing is sure, there will always be grey areas in the Bible till Jesus comes. for these grey areas that God, in His infinite wisdom, has chosen not to reveal details to us, we have to console ourselves with the counsel of Moses in Deuteronomy 29:29 that “The secret things belong to the Lord our God, but the things that are revealed belong to us and to our children forever, that we may do all the words of this law." The focus of this study tells me that Lucifer's fall from heaven had started to affect Adam & Eve when they noticed in the garden of Eden that they were naked and it continued through to their son Cain, who killed his brother. We see the same characteristics of Satan in Cain , he was proud, angry & jealous of his brother who had presented the acceptable offering to God. Cain's anger towards his brother was not justified. It was a premeditated murder. The struggle between good & evil was taking effect and Satan's influence was evident. Which are these people that were to kill Cain that made God to put a mark on him? I am not still satisfied on the answer given on Gen 4:15 God seems to be protecting the murderer. Can someone help. This is a good question. I think, Kain was protected, even as a murderer, because God wanted to grant him another period of probation to give room for repentence. Disregarding God`s protection he went on bulding a fortified city to defend himself rather than depending on God for promised protection (Genesis 4:17). Kain became the head of a rebellious generation, culminating in a condition of the earth that called for God`s judgment (Genesis 6:5). At the same time it was an object lesson for the universe (1 Corinthians 4:9) demonstrating as to what would be the result if evil would be left unpunished in righteous judgment: to make room for a new beginning after the flood. Mweemba; It can be said that God is protecting the murderer. True. Just like today God is protecting you and I who are the chief of sinners. God loves the murderer, the sinner but HATES the sin and actions of a sinner. Further, who are we to judge. Christ challenges us that "whoever has not sinned, let him take the 1st stone and throw". I am sure I wont be the 1st to throw that stone, will you? Evidently, God let Cain the murderer live (and actually protected his life) in order to show the world the consequences of letting murderers live. In today's world, I believe we are seeing those consequences. Society is almost totally demoralized already, and the world is ripe for destruction. Mweemba Renford wrote that, "God seems to be protecting the murderer"
The King James Study Bible "
(Gen. 3:21)The"mark; sign"or pledge was the concrete evidence of God's promise. Romans 5:8 gives us the answer to your delimma. Why is it that Cain's gift was not accepted? Hence, from all eternity, there is only one solution for sin as a human problem. Abel worshiped God along this line. All human beings after the fall (post lapsum) are sinners by way of inclination to sin. Moreover, Cain had a very heavy sin problem (Genesis 4:6-7), which would necessitate a sin offering. You may notice, the ceremonial law prescribed that the offering of the first fruit must be followed by the offering of a lamb without blemish as a burnt offering. After that a cereal offering is offered (Leviticus 23:9-13). Thus, the center of the fruit offering is the cacrifice of a lamb. Someone may ask, how could Cain know that? Well, there was an oral tradition long before the sacrificial statues were written down. Standing in that oral tradition, Abraham obeyed God, kept His charge, His commandents, His statutes and His law (Genesis 26:5). Charge, commandments, statues and law. Not only were the moral commandments transmitted in that oral tradition, but also the cereminial law in its basics. Abel also offered fat protions from his animals -- the inmost parts: (Genesis 4:4). In this offering ritual he followed the prescriptions of the ceremonial law (Leviticus 3:12-16). How did he know? From oral tadition. I like Winfried's reply, and would like to suggest an additional element. Mrs. White writes that, "Cain and Abel each brought an offering to God. The object presented by each was good in itself, but the Lord accepted the offering of Abel, while he rejected that of Cain." Changing the scene a little. When we bring tithe to God... if the tithe we bring is 8% or 12% or 25% of our income, will it be accepted as a "faithful tithe"? No, it cannot be. Why not? Because we have decided the amount, when it is not our decision to make. This doesn't deny us the ability to offer more, if it's in our heart to offer more... but it is an additional freewill "offering" - it must not be included in the tithe. That is God's, and He has determined the amount. I hope you can find some relevance in this to your question. God taught Adam and eve the proper way to worship which was a shadow of what Christ would do for them and us. The obedience in shedding of innocent blood was the price to pay for sin at that time. Fruit and vegetables were not that price nor was the obedience or faith in what God did and said he would do. Yes, the offering of a lamb was an offering of faith. By contrast, Cain's offering represented a trust in His own work. He was doing God a favor by bringing an offering to Him, or so he thought. Inspiration says, these two brothers diffed widely in character. Abel had a spirit of loyalty, he saw justice and mercy in the Creator's dealings with fallen human race and gratefully accepted the hope of redemption. But Cain cherished the feelings of rebellion and murmured against God because of the curse he pronounced upon the earth and upon the human race for Adam's sin. He permitted his mind to run in the same channel that led to Satan's fall- indulging in the desire for self-exaltation and questioning the dive justice and authority. This shows that from their childhood, they were taught the oracles of God's requirements for remission pf sin. It was actually a test to them as to their parents. Correct mode of worshiping was taught to them. sin spread quickly if not controlled & can affect many people. let us run away from sin to avoid condemned from God. Can someone shed light on the idea that Eve thought that Cain ,and then Seth were the "promised deliverer"? As the author so ambiguously seems to claim. Have read YLT and Ellen White 's writings on the subject . Would appreciate some insight where this comes from. Don't we think God was in communication with Adam and Eve after they were expelled from the garden? Didn't God promise in the Garden of Eden after the fall that He would send a deliverer? It was probably just natural for Eve to think that her first born and then Seth, as Cain had been banished, might be that deliverer. Just as God told Adam and eve to not eat of the tree lest ye die so it was he said your seed shall bruise his head God never gave details in either case. Trust in God's word requires patience. God told Abraham he would bare a son however neither he or is wife were willing to wait on the Lord. Eve was hopeful of the deliverance God promised but it was not according to her time neither was her expected death for eating of the tree. I left the Seventh Day Adventist Church many years ago and have not missed it at all until I read all the responses coming in on this subject. It reminded me of the "old days" when I was an active part of Sabbath School; I miss the sharing of ideas, the thought provoking comments, the Bible study and it just felt like I was back in class again. I have not left my faith in God; in fact when I left the church He was the One holding me and bringing my thru the pain at the time, much like Eve must have felt when she lost her son whom she thought was the "promised one" when he killed his faithful brother. God will never leave us, He holds us even when we struggle; in fact I think when I struggle I feel His arms tighter around me. I understand hurt and I understand salvation. Isn't that the hope that God gave Adam and Eve and they have passed down to us thru the many generations? Hi Anita, Let me say, "Welcome!" It is good to see someone who has kept their spiritual faith even when they have left the church. I worked for the church for many years and have seen it both at its best and worst. I realised a long time ago that my faith had to be something that was personal and not dependent on organizations and personalities. Having said that, I too have come to appreciate the importance of the discussions we have with our community of believers. Welcome to the blog and we hope that you both listen and participate and continue to be encouraged. We look forward to hearing more from you.